Before Lisa and I came,we were asked what age group we preferred to teach - elementary, middle, high school. We didn't have a preference. Since we've never taught before in a formal setting, we didn't really know what to expect. Now that I'm here, and have a few weeks of high school teaching under my belt, I have to admit: I'm kinda wishing that I had requested younger kids. Don't get me wrong: I love my school. The teachers are awesome, the students are great, and I have a great office and classroom. But as a brand new teacher, my only qualification being my disposition to speak English with an American accent (and sure, a week of EPIK training), I'm kinda overwhelmed. I feel like I was just thrown into the deep end of the pool on my first day of swim class. During my first week here, without having ever developed a lesson plan in my life, my co-teacher asked me for an entire year's worth. The actual teaching isn't what has been bothering me - it's the prospect of coming up with challenging yet entertaining lessons every week for an entire year. It's easy to entertain elementary or middle school students with songs or clapping games or bathroom jokes. High schoolers are not only more advanced (at least, they SHOULD be), they are disinterested in everything having to do with school. They are so over it. I've had luck so far because I'm still a novelty in my school. But my smile and gnarly beard can only carry me so far. Maybe this is a simple "grass-is-greener" sort of feeling. Middle school students can be hellions, so I hear. High schoolers, on the other hand, are often too tired to give me any sort of trouble. They stay at school until 10pm or later, even on the weekends, so it's not unusual for them to nod off multiple times during class. But I don't just want to supervise 50 minutes of nap time; I do actually want to help them improve their English. I could easily keep them entertained by showing "Pirates of the Caribbean" (a Korean fave) over three weeks, but they'd get very little out of it. In the end, I have to admit, almost all of the pressure put on me is my own. The students don't really care one way or the other, and the teachers have given me free rein to lead the class in any direction I see fit. I don't have much room for complaint, or even worry. I'm in a pretty damn good place. 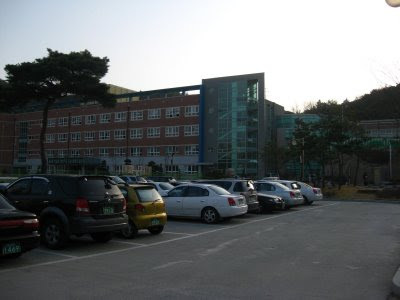 My school and parking lot. The courtyard. During lunch break some students play badminton here. 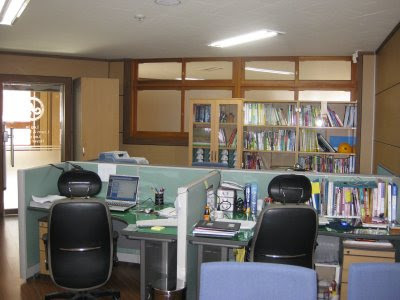 The office I share with my co-teacher, Soon Yung, and Miss Yoon. Mine is the desk without any books on it. The doors to my classroom. Dream Big Make it! My classroom. 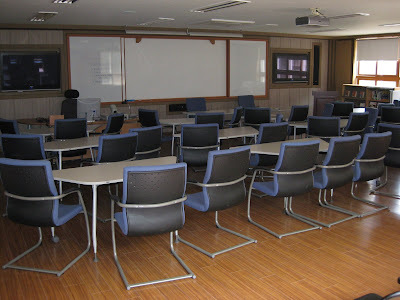 Two flat-panel HDTVs, two projectors, about 20 laptops and five desktops for student use, a document projector, DVD player, and surround sound. 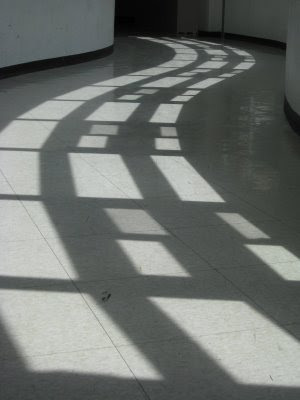 Cool light patterns in the hallway on the way to the cafeteria. 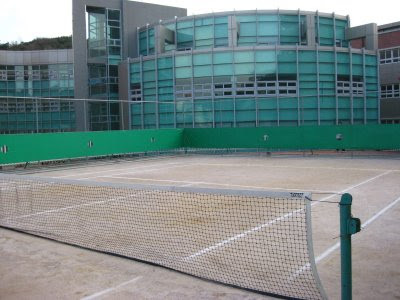 The school's clay tennis court for teacher use. On Monday Mr. Gwun, the Chinese Characters teacher and one of my favorites, invited me to join some teachers for a doubles match. In spite of my miraculous improvement over the course of the game, the PE teacher and I lost in a tie-break. Everything looks sparkly clean - love the high-tech classroom! Even though Even though I'm challenged by food allergies, the food there is appealing in many ways, not least of which is visually. Hope you find resources to your years worth of lesson plans. I've only played tennis on clay a few times, curious if you found that changed things. Clay is supposed to be much slower, but given that I haven't played in several years it seems pretty darn fast to me. Spin is a lot more effective - the only weapon in my arsenal right now is putting a little english on the ball. the teachers don't seem to expect that. You have a tennis court?! I am jealous. I do have a brand new classroom for my students to play computer games and sleep in though. Yeah, it is a nice perk, only open to teachers! It has been instrumental in allowing me to come to terms with the fact that I'm not as good at tennis as I am in my head. Who would have thought that you'd get better at tennis (of all things) in Korea? You should put some english on it...so appropriate. 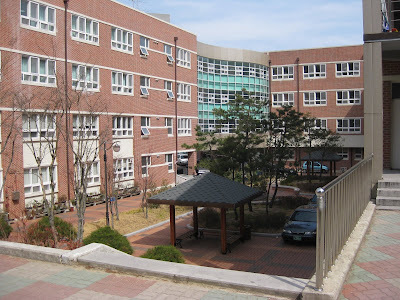 That school looks beautiful, especially compared to my high school. Don't lose faith in the high schoolers, you will find different ways as you go along to keep them entertained by your knowledge. @john c...english on it. nice. Just found your blog, and going through your archives. I'm considering teaching in Korea, and have this very concern- I'd like to do well and enjoy my work, but have no idea how to lesson plan. I've not done much teaching before, and really have never had to develop a curriculum. It sounds like other grades have a more set curriculum, or even lesson plans provided- is that right? Any recommendations for someone in my position?